Juliet Huddy: Iran is warning the United States they will launch strikes against America or Israel if we attack their nuclear facilities. 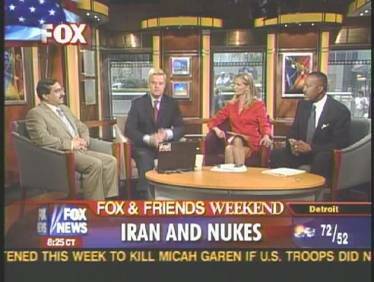 Jafarzadeh, Strategic Policy Consulting president and fox foreign affair analyst, welcome to the show. Julian Phillips: How serious can we treat this particular threat here from Iran in your estimation? Alireza Jafarzadeh: I think this is in line with what Iran has been doing for the past few years. The preemptive strike that the Iranian regime is talking about, I tell you honestly, I think they have already launched this with what they have been doing in Iraq. They are already involved in attacking both the Iraqi Interim Government, the Iraqi people as well as the United States. Julian Phillips: So are you saying by these insurgents? Is that what you’re saying? Alireza Jafarzadeh: Exactly, and I think the nuclear weapons program of Iran is part of their larger regional strategy that is in line with what they are doing in Iraq. Mike Jerrick: You remember back in 1981, Israel took a chance and sent a missile over and destroyed a nuclear plant there in Iraq. Are we close to having that happening in Iran and if they do that, of course we, America, will have to green-light that or no? 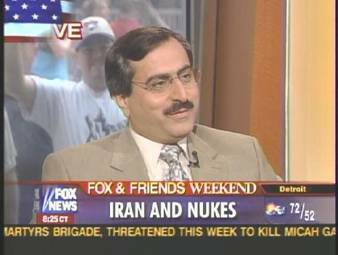 Alireza Jafarzadeh: Well, First of all Iran’s nuclear threat has to be taken very seriously. This is very serious. They are very close to getting the bomb. According to their own assessment within a year or so they will get to that point. So something serious must be done. I am not sure if a military strike would be the solution. Because, number one, Iran’s nuclear weapons program is so decentralized and it is definitely very hard to target and plus, we only know what we know. And you’ll never know what you’re hitting, because they might have parallel programs. In fact, I am sure they have a number of other locations that have not been disclosed yet. So what needs to be done is a bigger strategy that would include both the nuclear threat of Iran and what they’re doing in Iraq and in terms of their support for terrorism which is a grand strategy of pursuing a policy of regime change, short of military strikes but relying heavily on the Iranian opposition. Juliet Huddy: What is their threat specifically to the United States? Hurting our troops over there? Launching a weapon at Israel? Launching it at us? Alireza Jafarzadeh: Well, I think it’s actually a number of things. Juliet Huddy: Everything? All of the above? Alireza Jafarzadeh: Everything. Because, you see, for the Iranian regime a nuclear weapon is a must, is a guarantee for its own survival. They have to get it. In parallel to that, erecting a sister Islamic republic in Iraq is also a must for them. So they’re not going to back down on those. What they’re trying to do by escalating their threats, they’re hoping that the US will back down. And it would be ready to provide concessions and would not be so decisive. You know, there is an upcoming meeting of the IAEA, International Atomic Energy Agency in Vienna in September. And they will have to decide what to do with Iran’s repeated violations and deception. And one question is that whether US can get the Europeans to refer Iran’s file to the UN’s Security Council. Julian Phillips: Well, you have all these questions and allegations and all these fear, but how much confidence can we place on the UN, the weapons inspections, and Mohammad ElBaradei to confirm or deny reports as to what they have and what they don’t have. Alireza Jafarzadeh: Well, I would not put all my eggs in one basket. I think I would emphasize on working on the IAEA level, but at the same time in parallel to that I would step up political pressure on Iran. So far, the inspections based on the information revealed by the Iranian opposition; actually, as you know, much of the information did not come from the IAEA. It came from the Iranian opposition and then the IAEA inspectors went there. They have found some evidence of violations. And I think what they have found so far is enough to refer Iran’s file to the UN Security Council. I think the United States should urge the Europeans, should urge the members of the IAEA to refer Iran’s file to the UN Security Council and at the same time tighten screws on the political side. That’s the only way you can succeed. Juliet Huddy: Alireza Jafarzadeh thank you very much sir for joining us today. Juliet Huddy: We appreciate it.